A quality, properly functioning sump pump can be an important investment for keeping your home dry. Our experienced and trained crews can assess your needs and recommend and install the best pump for you. Quality sump pump function is an extremely important investment for maintaining a dry water-free home and basement. Our plumbers at Plummer Enterprises can assess your home’s location and the area water table, recommending the best sump pump for your home’s location. Plummer Enterprises offers inspections and repair services to keep your sump pump functioning properly to avoid serious malfunction to your sump pump in the event of a storm. The sump pump sits in a pit in the basement of your home and collects underground water. 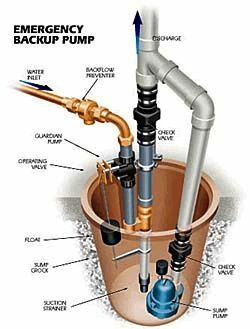 The sump pit collects water from the drainage system protecting your foundation and ejects the water through a discharge pipe out of your home. Water-driven back up pumps take over when the electricity fails, using water flow to siphon the existing water from the pit. A sump pump keeps your basement and the area under it from filling with water and flooding in the event of a heavy storm or large amount of snow melt. The sump is a reservoir below your basement that is intended to fill up when levels of groundwater increase, rather than allowing the water to get into your basement causing serious damage. A sump pump moves that water up to ground level and pushes it away from your home. It is necessary to keep a properly functioning sump pump in your basement to ensure the health and integrity of your home is preserved. Sump pumps will solve most basement flooding and foundation leaking issues by controlling the amount of ground water around your home. Plummer Enterprises are full service residential plumbing experts, installing sump systems in any basement that will direct water from around and beneath the basement foundation into a sump pit avoiding flood damage during storms and snow melts in Ohio. Our electric-powered sump pump installations allow the accumulated ground water to be discharged out of the pit and into the city storm drain all according to city code requirements. Over time sump pumps will need to be replaced. Our technicians at Plummer Enterprises provide full service sump pump replacement with quality sump pump models recommended specifically for your property’s water table. Ohio is prone to rainstorms, snow melts, and unpredictable heavy precipitation so we make sure the sump pump in your home or business is prepared to handle the water load. Regular testing of sump pump function can avoid emergency situations during heavy storms. If your pour a bucket of water into your sump pit the pump should turn on. If your sump pump is not responding to an increase in water levels in the sump pit you should seek out a service professional from Plummer Enterprises to inspect the pump mechanism before the pump fails. Our service experts will diagnose your situation and recommend quality service solutions to remedy your sump pump malfunction woes. We also provide water and battery driven back-up sump pump systems to help keep your basement dry in power loss or failure situations. Plummer Enterprises has on call expert plumbers with a wealth of sump pump repair knowledge that will ensure your sump pump is fixed correctly in a timely, honest manner for a fair price. Plummer Enterprises has been performing sump pump repair, making sure basements stay dry. We can take care of residential and commercial sump pump repairs and replacement with a quality guarantee. Call us today at 419-740-7126!